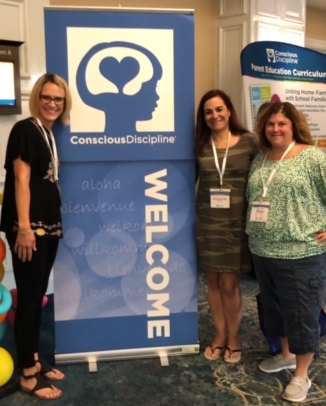 Recently our DuPage early childhood programs sent representatives to the “Elevate Social Emotional Learning: Start Strong with Conscious Discipline the First Six Weeks” conference in Orlando, Florida. Jennifer Sticken, Education Coordinator; Margarita Arbelaez, ERSEA & Family Engagement Coordinator; and Marya Mansavage, Education Coach, spent time reflecting on their practices and learning to incorporate conscious discipline into their curriculum. This conference focused on discovering proven strategies to increase teacher effectiveness and satisfaction and academic performance while reducing discipline referrals. Participants also focused on learning the keys to cultivating a healthy, connected home and school culture with specific practices and structures that bring about transformational, sustainable change in homes, classrooms, schools and communities. In addition, they left the conference with a complete SEL plan for the first six weeks that is geared towards setting up the entire school year for success!